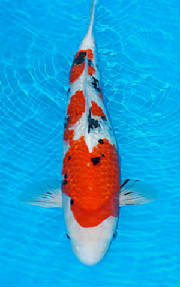 The Oregon Koi & Watergarden Society’s fourth annual Koi show June 19th & 20th was it’s first open show. There was a Junior division this year that proved to be very competitive. It is nice to see the younger members get involved. The OK&WS is defiantly a family oriented social club. Due to the limited number of participants and the lack of funds typical of a young club there were no koi categories. The fish were entered in four size categories instead. There were three divisions: Nishikigoi, Junior division and longfin Koi division. We had a total of forty two fish entered. There were many special awards. I’d like to point out that the beautiful trophies were donated to our club by Morris and Jeannie Bush from Vancouver, WA. We are very, very grateful. Thank you so much. There is something special about a small town koi show. There was an almost carnival atmosphere that appeals to the young and old alike. There was a friendly raffle selling competition between Albert Mason and Brittney Brock. People getting involved, showing koi for the first time and having out-of-towners attend the show and banquet was special indeed. We were honored to have Mike Winters from Wintergreen Nursery give a bonsai demonstration. There were a total of seven dealers/merchants participating. I urge you to help support these dealers/merchants who have helped support our show when ever possible. Patti Magee and Steve Kaufman came down from Vancouver and set up shop. Sue Boydstun from the Idaho Water Garden and Koi Society drove all the way from Boise. The previous weekend was the PNKCA convention, so I know she was looking for an escape. 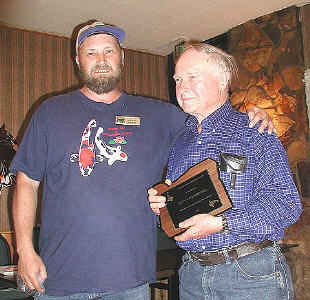 Sir Jerry Tyler drove down from Lake Bay Washington. Bought a kohaku from Rod and entered the show at the last minute. One can not say no to someone that has been knighted. Sir Tyler won Best Baby. A special big thank you goes out to Bob and Joan Finnegan for taking the time and expense to fly up for our very un-traditional koi show. As soon as they got back to So. California they left for the AKCA Seminar in Hawaii. Busy people! Thanks for judging our show. We hope to have you back again when you have more time to see the sights. 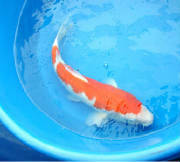 Not to brag too much, but it seems the most popular koi in the show was my 24” Kujaku. This Kujaku won ALL the “Choice” awards. Peoples Choice, Members Choice and the Presidents Choice. The judges were impressed also and gave it 1st Place in the 16” and over category. Along side the show tank was it’s picture taken two years previous showing snow white where the gray is now. 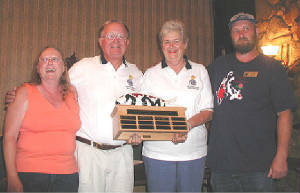 Our sister club, the Southeast Section of England sponsors a friendship award every year. 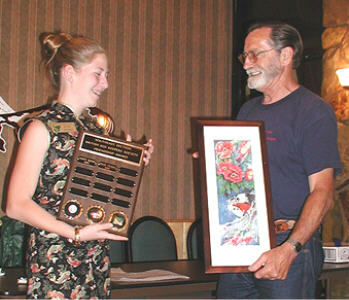 The SE Section award this year went to Heidi Tschan, age 12 for her 20” Sanke. It was a pleasure to make this presentation to one of our own and a very energetic young member. Along with the traveling award which will forever bear her name, Heidi also received an original watercolor by By Patti Magee. Congratulations Heidi. Thank you Kim for arranging the Tom Tom Restaurant for our banquet. The banquet at the TOM TOM Restaurant was full! It was a lot of fun, and we had a great time. Thank you Kim!